Autohaze is an 'all in one' very strong haze remover for occasional use on very stubborn stains. A convenient 'one pot' haze remover paste based on a unique caustic and solvent mixture. Allows rapid and effective removal of ink stains and ghost images in less than 10 minutes. Ideal for busy print shops or where maximum haze removal performance is needed. 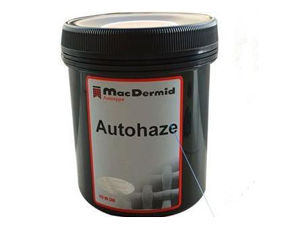 Autohaze has been formulated for effective removal of hazes and ghost images commonly left after stencil reclaiming. It negates the need for an additional solvent application.